The Spanish young model Nuria Rothschild is the new face of fashion. This Madrid-born model made her breakthrough in the fall of 2016 thanks to Anthony Vaccarello. The designer chose her to take part in his first show as the creative director of Saint Laurent –following Hedi Slimane-, the most awaited show of that Paris Fashion Week . 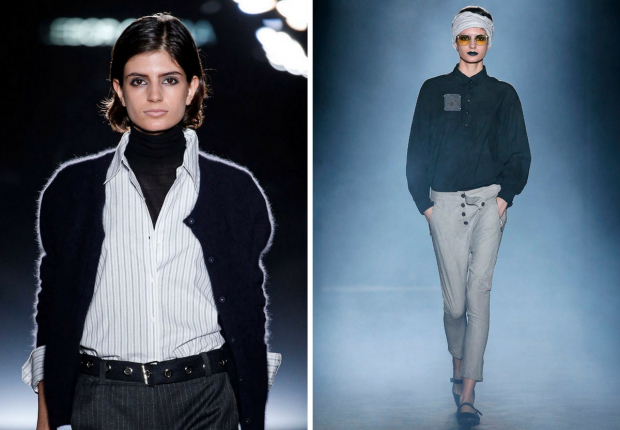 Her boyish looks and seventies style, which remind of another Spanish model Alba Galocha, didn’t go unnoticed in the international scene, nor here, as Nuria Rothschild has been walking the 080 Barcelona Fashion runway since January 2017 edition. Following the steps of her colleague Mayka Merino, Nuria Rothschild decided to move to London for her career. From there, her global presence has been growing and among her works, there are such luxury firms as Victoria Bechkam, Stella McCartney and even opening Emporio Armani’s show in last Milan Fashion Week. To her success on the catwalk, there are also many shootings in top fashion magazines, like Spanish “Vogue”, as well as her first fashion campaigns for such brands as American Vintage and Oysho, to which she lends her face this summer 2018.This great start turns Nuria Rothschild into one of the models to follow up with. Who knows if she might get to the fashion Olympics like her much admired Gisele Bundchen, the model who she looks up to.